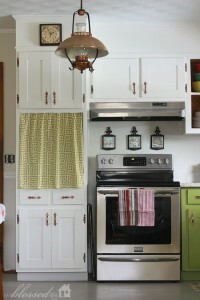 This week we share a wonderful example of white beadboard kitchen cabinets. It’s very hard to go wrong with this look, we think it’s timeless. Once upon a time, the only place you’d find beadboard in a home was as wainscoting in the “necessary convenience room”. In the old days this side by side beadboard style were used to protect against moisture in the bathroom. This old construction standby is now increasingly found as a homey, countrified decorative statement in kitchens. Renovations utilizing beadboard can come in a variety of options. Some folks opt for keeping beadboard to backsplashes or wainscoting around the kitchen walls. However, the intrepid folks at The Creative Crate have gone the extra mile and added white beadboard to their kitchen cabinet doors! 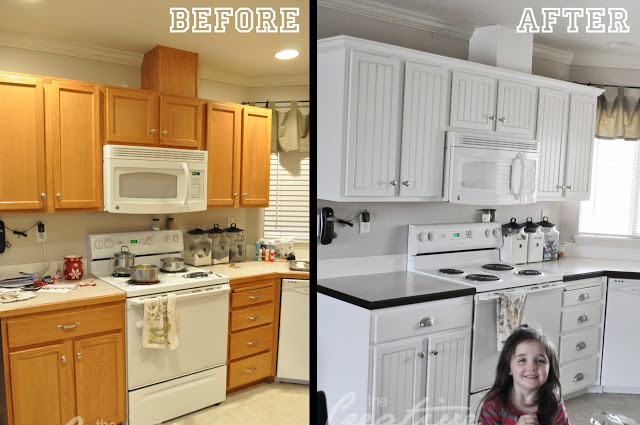 Stacie and her husband wanted to update the look of their cabinetry, but didn’t want to rip out the existing cabinets and replace them. They struck on an ingenious idea, taking beadboard and inserting pieces cut to fit into the existing door panels. Fortunately, their cabinets had deeper trim around the door faces than average. Deep enough that beadboard could be affixed onto the door panels with construction adhesive without completely sacrificing the recessed look of the doors. They used caulk around the edges of the beadboard inserts to smooth the transition and make it less noticeable. 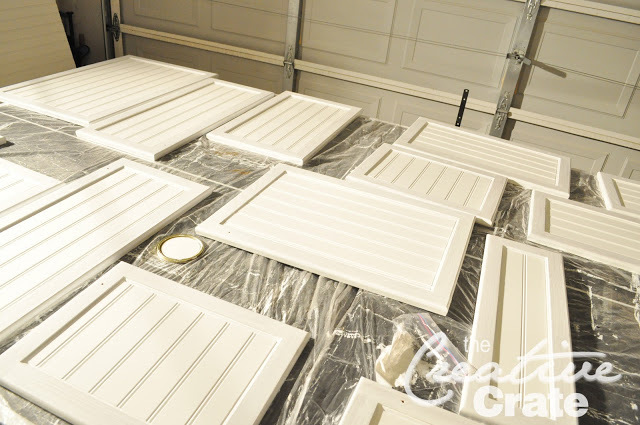 To turn them into white beadboard kitchen cabinets they painted the updated door panels with a product called Rust-Oleum Cabinet Transformations which is available at the local home improvement retail center in kits. These kits require no sanding preparation but do require a thorough scrub cleaning and de-gloss of cabinet surfaces. 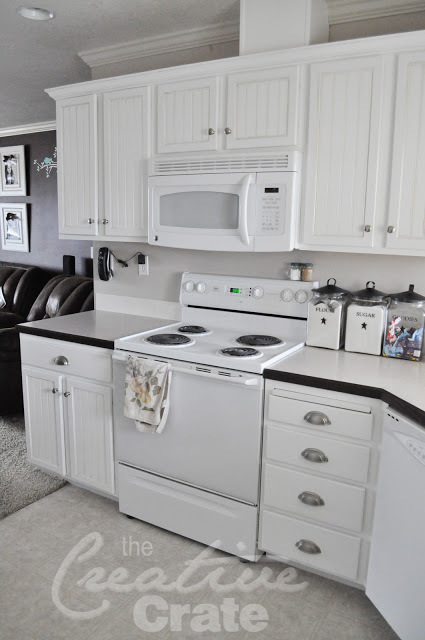 Stacie and her husband discovered that two coats of the Cabinet Transformation paint were sufficient on most surfaces. In some areas full coverage required three coats. The kits come with wipe-on glaze to add an antique effect if desired. A clear coat finishes the effect and seals in the paint. Stacy found that the glaze added a yellow tint to the paint which she did not like and stuck with using the clear sealant over the painted surfaces. This antiquing effect may be desirable for your remodel, depending on the chosen décor and the color of your appliances. Stacie’s stove, refrigerator and microwave were all a pure white, hence the yellow tint clashed with her desired final look. The paint of her choice was applied to drawer faces and the leading edge of her pull-out cutting board. 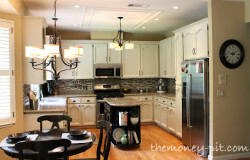 A finishing touch included crown molding along the top of her cabinets, painted white to match the cabinets. Drawer pull and cabinet door handles were swapped out for brushed nickel hardware. Stacie also painted her countertops, using Rustoleum’s companion product Countertop Transformations, also available at home improvement stores such as Home Depot. 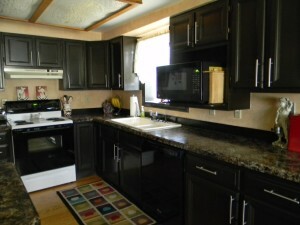 The leading edges of the countertops, which were wood, were painted in a contrasting black color to match the under cabinet backsplash and wall area above the cabinets. 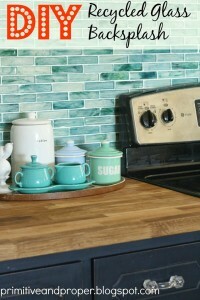 Click here for more countertop ideas and photos. And if you have installed white beadboard kitchen cabinets we’d love to feature your project. Please submit your project to us today.